Enjoy charm, comfort and convenience when you visit Casa de la Luz ('House of Light'). 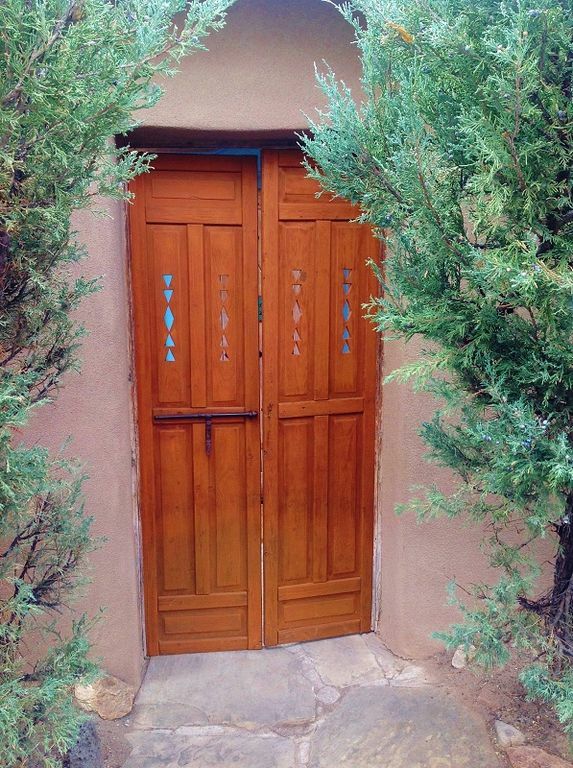 This beautiful home on a lovely, quiet hill is just 7 blocks from the Santa Fe Plaza. This house boasts all the features of a classic adobe (vigas, beams, latillas, hand-troweled plastered walls, Saltillo tile, Mexican tile backslashes and accents, tin work and old wooden doors) however it feels light and modern, unlike many traditional homes. Perhaps its most unique aspect is the combination of a serene, peaceful setting in such close proximity to the color and excitement of downtown Santa Fe. What a pleasure to stroll down the hill to shop, dine and sight-see, with the option of returning to your quiet retreat whenever you tire of the bustle. And none of the hassle of driving or parking! The house is decorated with original local art and hand crafted furnishings, and offers amenities for every season. In winter, get cozy by the wood burning fireplace, and in the warmer months, enjoy the many inviting outdoor spaces, including a balcony with wisteria trellis, a garden deck and a private walled terrace. This newer-construction adobe boasts a great floor plan. The living room with fireplace, dining area and kitchen all open on to one another. These rooms, along with the mater bedroom with king size bed and full bath are on the first floor. On the lower level, there is a large open suite, including a semi-private sleeping alcove with king bed, a full bathroom and a sitting area opening onto a private garden. This sitting area has a futon couch which converts into a bed for two more guests. With 1600 square feet, the home is large enough to offer privacy for all without losing its intimate feel. Amenities include 3 flat-screen T.V. 's with cable, high-speed wireless internet, dishwasher, washer, dryer and air-conditioning. There is a one car garage with parking available for a second car. Special Note: This property has a permit from the City of Santa Fe for short-term rentals, Permit # 11-00104264. Enjoy the peace of mind that your rental will not be interrupted by the City as it enforces against properties that do not have City permits. I fell in love with Santa Fe many years ago and visit as often as I can from my home in Boulder, Colorado. I have enjoyed creating a space for visitors that is classic, stylish and comfortable, and that sits in close proximity to all that Santa Fe has to offer. I chose this historic Eastside neighborhood for its charm and atmosphere, as well as its proximity to downtown. Here, you can wander the lovely back lanes and look for the 1920 Cross of the Martyrs, located at the top of Rosario Hill on Paseo de la Loma (Accessible by stairs from Paseo de la Loma). If you climb the wooden steps to the hill where the cross stands, you will see the following history inscribed on a plaque: In 1598 a group of Spanish colonists, led by Juan de Onate of Zacatecas, Mexico, established a settlement along the banks of the Rio Grande north of present-day Espanola. In 1610 Governor Pedro de Peralta relocated the capital of the province to Santa Fe. Between 1610 and 1680, colonists moved into New Mexico, living primarily along the Rio Grande. Franciscan friars established missions at most of the Indian pueblos. Life was not always peaceful. In order to regain control of their homeland, in 1680, many pueblo people, led by Pope', a San Juan Indian, united to drive the colonists out. This action became what is known as the Pueblo Revolt. At this point, the rest of the settlers fled south to El Paso del Norte. It was not until 1693 that the province was peacefully resettled under the leadership of Governor Diego de Vargas. Thoroughly enjoyed our stay - very comfortable, homey, well appointed property; great location, and excellent, responsive service from the owner. Give this a Five Star rating. The location was perfect! It was close to the road up to the ski mountain and also in walking distance to the Plaxa. We would definitely rent again! We thoroughly enjoyed our time in this home. Lovely and tastefully decorated, it accommodated our family of five easily. Walking to the plaza was easy and quick, although as another reviewer pointed out, the walk does require crossing a more major street. The owner was responsive to glitches in our travel plans (cancelled plane flight causing us to change to a road trip) and simple, independent check in meant our new arrival day and time caused no inconvenience. Would rent again and recommend highly. Loved the authentic southwest adobe decor. Kitchen well stocked with beautiful dishes, glasses, cookware and appliances for meals at home. And Old town restaurants just blocks away. Perfect for two couples with downstairs bedroom, bath and sitting area, and master bedroom on main level. Owner responsive to any concerns. Highly reccomend. Loved our stay .House was decorated with wonderful taste . Located in a perfect area for all of the Santa Fe attractions .Private bedrooms and bathrooms were great for two couples .We had a wonderful fire every evening and enjoyed having a garage to park in . I would recommend this home to all .The radiant heat was wonderful and we were toasty warm.Thank you Katherine we loved your home ! Well maintained and perfectly stocked. Every amenity considered and provided. This is a really lovely VRBO and we walked into town each day. The kitchen is also very well equipped for true cooking, full meal preparation and serving. Ideal for a party of five -- 2 adults and 3 teenage boys. Owner also very responsive to questions. Highly recommend this spot and would stay again! Santa Fe is consistently rated one of the world's top travel destinations for its confluence of scenic beauty, long history, cultural diversity, and extraordinary concentration of arts, music and fine dining.